1975 Honorary Fellow — granted to Society members whose career-based leadership, vision or other meritorious contribution has advanced significantly the interests of Vertical Flight Society and the vertical flight community. Mouille's citation was: "For the design of the Fenestron fan-in-fin tail rotor system and his continued efforts to improve the technology of our industry." 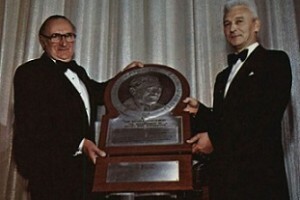 1990 Alexander A. Nikolsky Honorary Lecturer — given to an individual who has a highly distinguished career in vertical flight aircraft research and development and is skilled at communicating their technical knowledge and experience. Mouille's lecture was entitled, "Technological Evolution of French Helicopters." Mouille was born in Nord, France, on Oct. 30, 1924 and graduated from the "Catholic Institute of Arts and Crafts (Institut Catholiques d'Arts et Métiers, ICAM) in Lille, followed by the "Higher School of Aeronautical Works" (Ecole special des travaux aeronautiques, ESTAe) in Orsay [subsumed into the Arts et Metiers ParisTech in 1988]. With over 40 patents to his name, Mouille was instrumental in pushing the barriers of helicopter technology, such as with the hub NAT (Non-Articulated Drag) with visco-elastic dampers, the famous Fenestron©, and the Starflex rotor. He also invented the SARIB suspension system (Antivibratory Suspension with Integrated Resonator and Bar). The inventions by René Mouille and his collaborators are still widely used in the helicopter industry today. 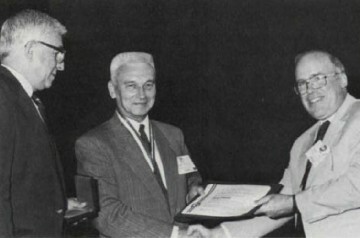 Mouille delivered his 1990 Nikolsky Lecture, Technological Evolution of French Helicopters, at the AHS 46th Annual Forum and Technology Display in Washington, D.C., May 21–23, 1990. 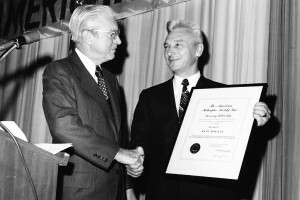 According to his Nikolsky Lecture biography, "Mouille has received nearly every major aerospace and engineering honor given by France, including the Medaille de l’Aeronautique, Ordre National du Merite (Chevalier), Trophee Brequet, Medaille du Progres, and the Grand Prix 1988 de l’Association Aeronautique." The Vertical Flight Society is accepting contributions to the Vertical Flight Foundation (VFF) towards the René Mouille Memorial Scholarship. Please go to www.vtol.org/donate to make a donation in memory of René Mouille.